Choose the bento-box for various home packed meals in box shaped containers, and based on traditional japanese bento-recipes. This saves on your kitchen carbon-footprint, gives you a wide variety of meals you can put together quickly, and can bring out the inner artistic side of you too. Becoming more and more popular in North America, the bento-box is basically a reuseable compact container, that holds a large assortment food varieties. It does have some history to it. Bento simply means "packed box" and is the equivalent to Japanese lunchboxes, which have been around since the 12th century, and made originally out of lacquered wood with sliding grooves that opened to see the food inside. The boxes have many sections to put food in, and a traditional bento-box consisted of fish, cooked vegetables, rice and fruit. At one point in time, the contents of a bento-box easily would distinguish between the richer and poorer classes of peoples, and so to avoid this, lunches were served to all japanese students at school instead. Of course, you can pack whatever you like in these great compact little lunchboxes. Some people pack them this way: 2 parts fruit and veggies, 3 parts carbs, and 1 part protein. No junk food, candies, or oils! The possibilities are endless really, no matter what kind of food you want to put into bento boxes and you certainly can. You can choose a favorite ethnic grouping, a theme centered around a holiday, purely health oriented, or just bits and pieces of leftovers from lunch for a snack, or lunch from dinner the night before. One of the best things about these bento boxes? It's the way the visual appeal is typically put to use. 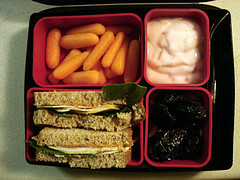 The way the lunches were traditionally packed, emphasized the beauty of the contents. Textures, colors, and being "visibly mouth-watering" are important aspects of the bento lunch. Visual appeal has always been important and still is. Kyraben-style is all about arranging the foods to achieve these qualities. There are many different bento accessories that can be used as well, if you want to spend the time in this type of food art. The foods can be decorated to look like funny characters, animals, plants and flowers with these assortments of tools. It's really quite a beautiful thing to see from those who are experienced and talented in putting together this type of a display in traditional japanese bento style. Aren't these beautiful combinations? Not sure I would want to stick my fork in there and ruin all of that hard work! If you have the time, it would be an interesting thing to learn how to do this with the bento-recipes cookbooks and gadgets that enable you to make these types of designs. 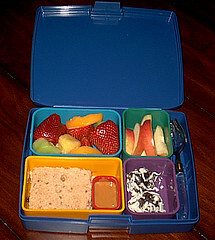 Your children are bound to love their bento-lunch-box and the food in it alot more often than they probably do now. It's a great incentive to get them involved in the lunch-making process and eat it all too! So, for something different and unique to you and your family, check out the world of the bento-box, and cut down on food waste and kitchen supplies. You'll have fun working with them I'm sure.